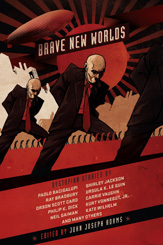 Anyone who is interested in the grim meathook side of the science fiction genre should pick up Brave New Worlds, the new anthology of dystopian fiction. Once again, John Joseph Adams has proved that he has a keen eye for a good story. These are not easy stories to read. Few of them have happy endings. However, I found them to be moving works of science fiction that will stay with me for a long time. Dystopias have been part of science fiction since the beginning. Brave New Worlds opens with “The Lottery” by Shirley Jackson, which was first published in 1948 by The New Yorker. It is the kind of science fiction that provokes tempers on all sides. People within the genre criticize its lack of obvious scientificitional elements and its magazine of origin. Deborah Treisman, The New Yorker’s fiction editor, noted on her podcast that the magazine received angry letters from its readers after “The Lottery” was published. Treisman also pointed out that “The Lottery” is the only story by a woman of the period to be regularly anthologized. Other classics that have been reprinted in Brave New Worlds include “The Ones Who Walk Away From Omelas” by Ursula K. Le Guin. This story should already be familiar to most readers, who will know exactly what to expect when they see Le Guin’s name on a collection of dystopias. However, in this context, it provides a respite for the mind’s eye. The world that Le Guin has built is beautiful — except for that singular, terrible room. The new stories in Brave New Worlds are also of the highest quality. Carrie Vaughn’s “Amaryllis,” reprinted here, has just been nominated for the 2011 Hugo Award for best short story. “Evidence of Love in a Case of Abandonment: One Daughter’s Personal Account” by Mary Rickert first appeared in the Magazine of Fantasy and Science Fiction, and was nominated for the British Science Fiction Award and the Stoker Award. I have an abiding affection for this story, in which all the brutality of a world where women are executed for having abortions is filtered through the eyes of a little girl who has never known anything else. Longtime listeners of EscapePod will recognize “Of a Sweet Slow Dance in the Wake of Temporary Dogs” by Adam Troy-Castro. This is the only story in the collection that I did not completely reread, as I remember how much it affected me the first time. It is, however, not the most brutal story in this book — and the argument over whether or not it even qualifies as a dystopia should be an interesting one. The stories are grouped loosely by theme. J. G. Ballard’s overpopulation classic, “Billenium,” is followed immediately by “Amaryllis” and Paolo Bacigalupi’s “Pop Squad,” in which children are vanishingly rare. Silverberg’s “Caught in the Organ Draft,” about a world where the young are required to donate their organs so that the terribly old can get even older, stands back-to-back with Orson Scott Card’s heartbreaking “Geriatric Ward,” in which people grow old and die while still terribly young. Brave New Worlds strikes me as being comprehensive enough to serve as reference book. It even includes a list of suggested reading at the end, for anyone who wants to pursue longer works of dystopian fiction. I recommend this anthology wholeheartedly — on a sunny day, and followed by something cheerful.